“For I know the plans I have for you,” declares the Eternal One. It is very early in 2017, and already the calendar for the entire year is filling quickly. As I look at the calendar, one of the high points comes right at the start: January 8, 2017 at 10:00am Eastern(3:00pm GMT). This is the day when MCC celebrates the Installation of Interim Moderator Rev. Elder Rachelle Brown as an Elder. 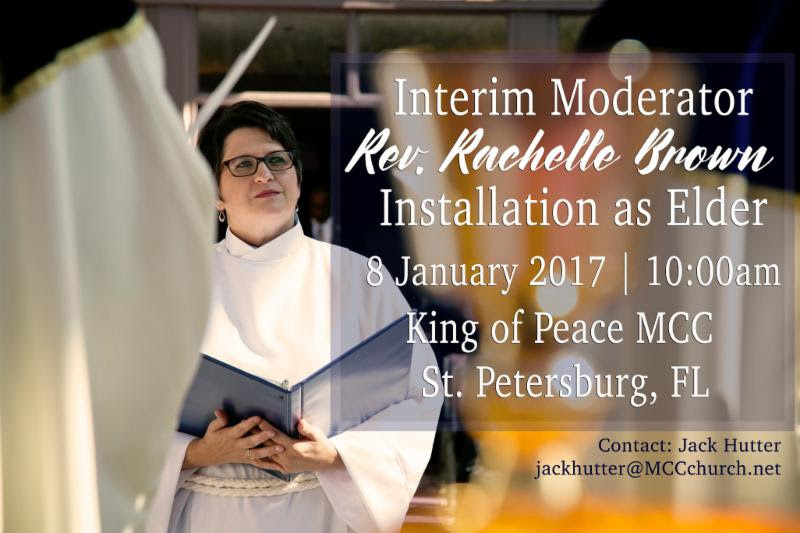 The Installation will be at King of Peace MCC in St. Petersburg, Florida. “Loving and Gracious God, we pray for your blessing on Rev. Elder Rachelle Brown as she is installed as an Elder. May it be a day of celebration, joy and vision that becomes an entry to a new outpouring of your Holy Spirit. Give her the grace to lead with holiness and wholeness. Grant her the energy to energize compassion in bringing Your love to our world. Guide her and us through Your Living Presence in us, around us, and through us.